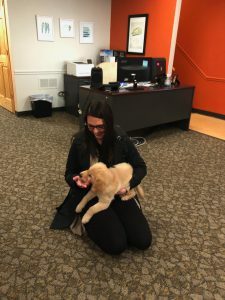 Here’s a little known fact about all of us at MorningStar: We love dogs. Basically, we’re running at a 1:1 dog to human ratio around here, and our dogs range in size from a 2.2 lb. Chihuahua to an 85 lb. Goldendoodle named Leroy. And, what’s even cooler is that our MorningStar dogs often make visits into the office to say hi!